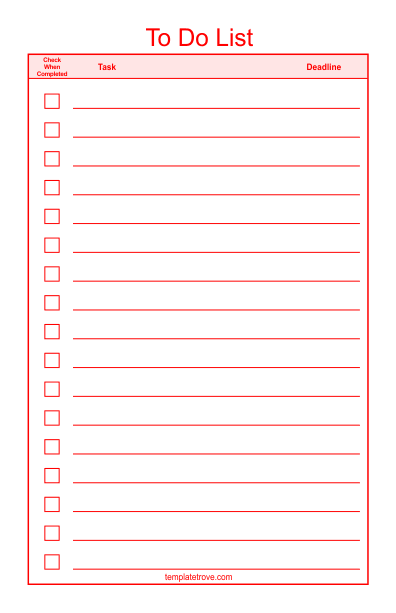 Handy checklist templates you can use for most any task. Several file formats to choose from may differ and are listed under description of each checklist template. Five colors to choose from including black, blue, green, purple and red. 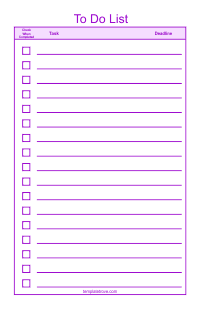 This checklist has the same layout as the template above, but prints 2 copies per sheet on 8 1/2" x 11" letter size paper. Finished size is 5 1/2" x 8 1/2". Print out this checklist on standard 8 1/2" x 11" letter size paper by downloading the PDF format. This template is available in Corel Draw, Word and InDesign formats. To Do List format with space for task at hand, deadline and a box to check when completed.